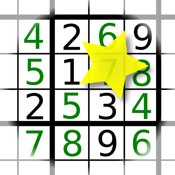 Sudoku Solve helps you when you're in a hurry and got stuck with a sudoku board. Just fill in the known numbers and you'll get the solution. The solution appears immediately when the given numbers are sufficient. You may also try to leave some numbers out in order to see which numbers might have been omitted for a solvable sudoku.